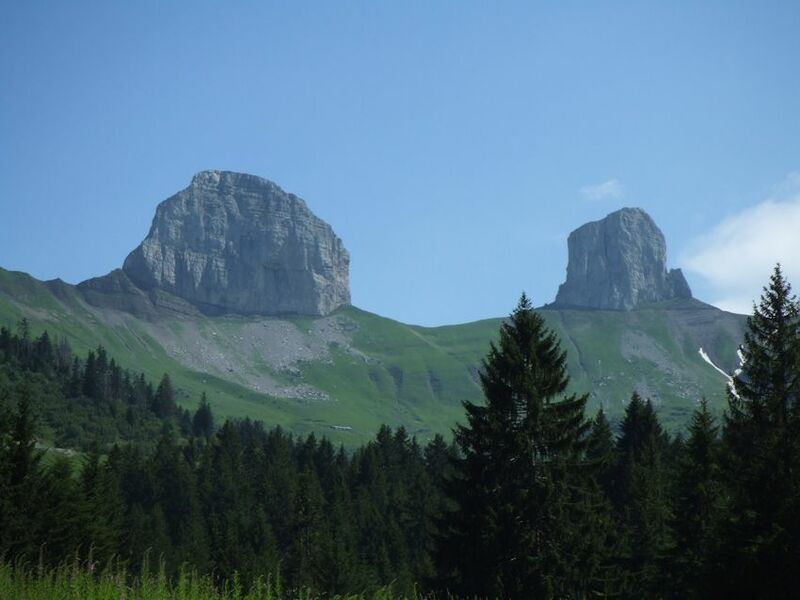 The Tour d'Aï is a long pier of a mountain, on the left in the photo below, 2331m at the top of it but only 5 metres higher than the Tour de Mayen (which seems higher in perspective) just to its right. 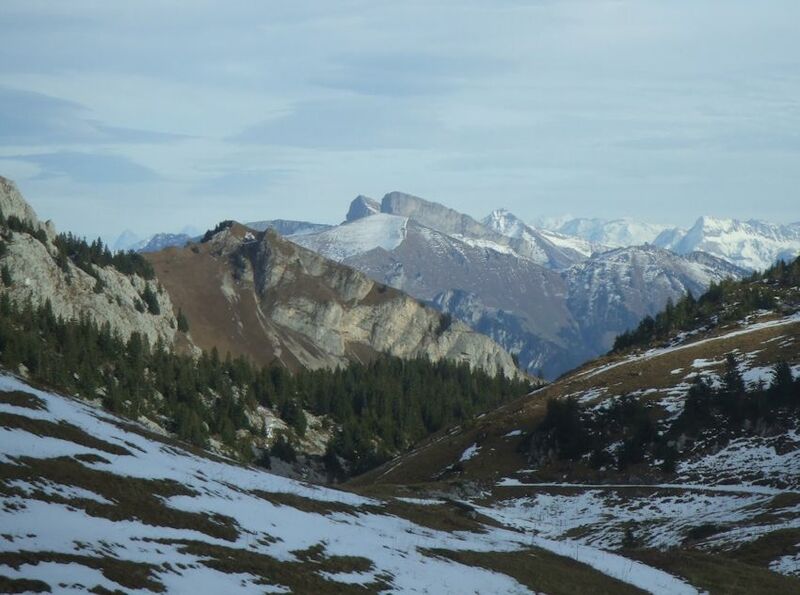 The very most fabulous collection of local mountains anywhere, 7km across from left to right. 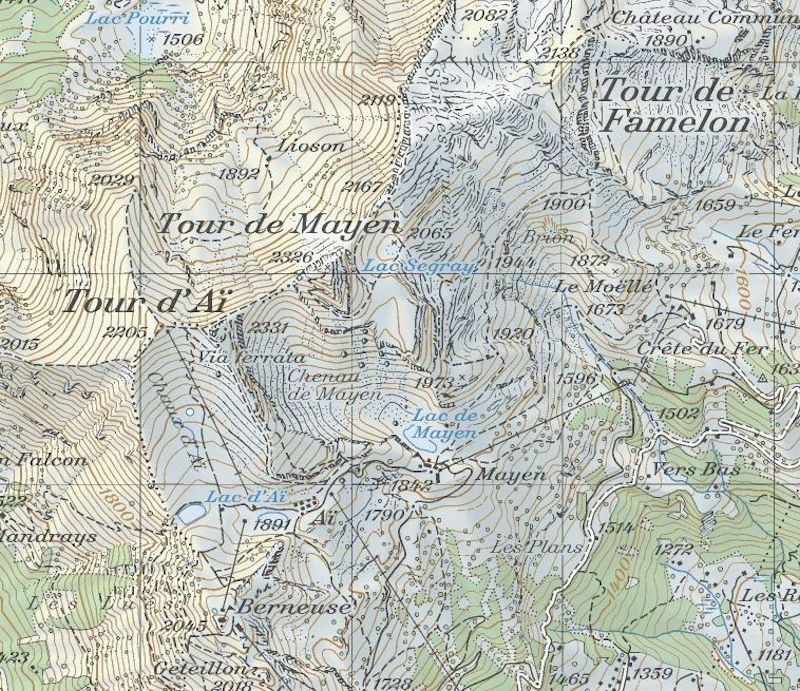 The Tour d'Aï is on the far left, then Tour de Mayen, then the ridge of Truex, then the Tour de Famelon. 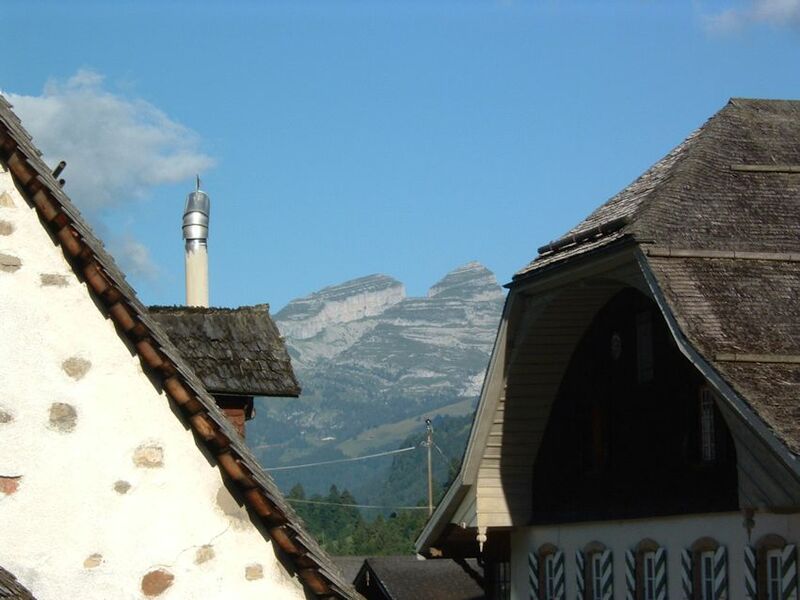 The Tours d'Aï and Mayen from La Forclaz from the same angle, to their southeast. 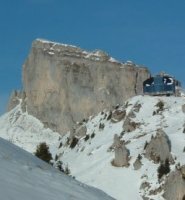 There is only one walking path up Tour d'Aï, which begins over the Lac de Mayen up through a notch in the cliffs on the left, slopes up the steep meadows and climbs on a chain onto the summit ridge, and then coasts along the top of the cliffs to the summit just left of centre in this photo. 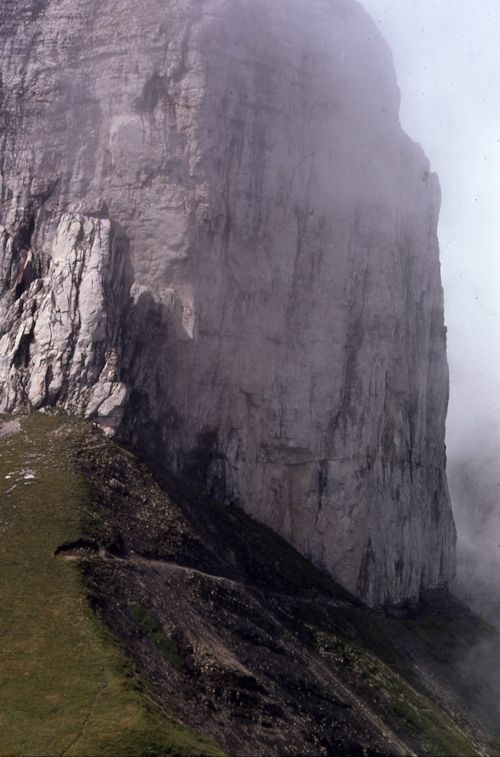 Tour d'Aï looming just right of center, at 2331m, in about 1981. 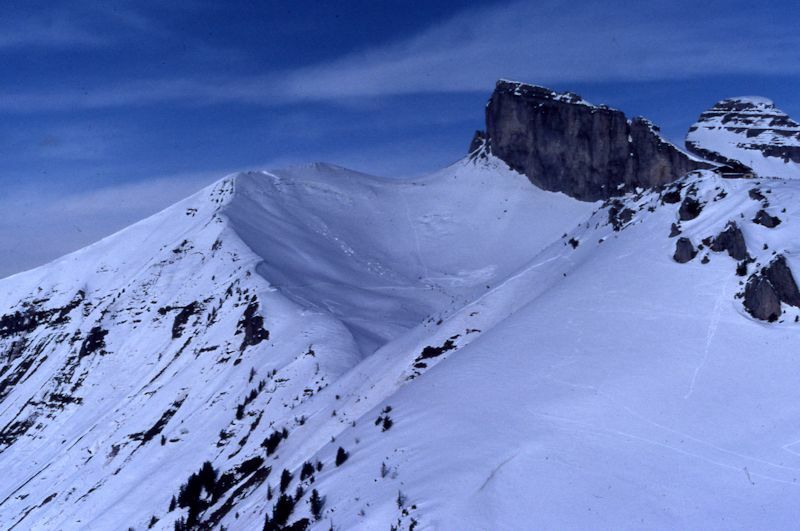 The ridge of Chaux de Mont (2205m), now a skiing area, runs off to the left, La Berneuse is in the right foreground, and the Tour de Mayen (2326m) on the far horizon on the right. There are numerous climbing routes up this side of it, including a fairly new tourist "via ferrata", with ladder-rungs bolted into the rockface, up the Sphinx. 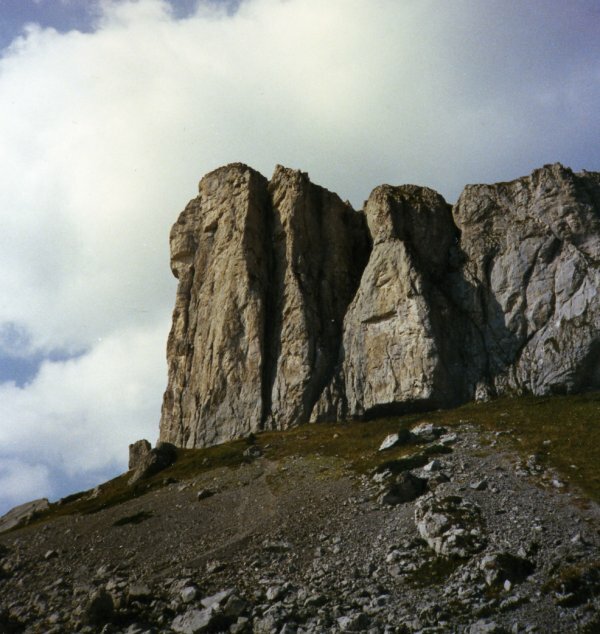 The classic Tour d'Aï climbing route, the Sphinx, seen from the direction of Lac d'Aï in about 1980. La Tour d'Aï from the back of La Riondaz, with the turning restaurant on top of La Berneuse (2048m). 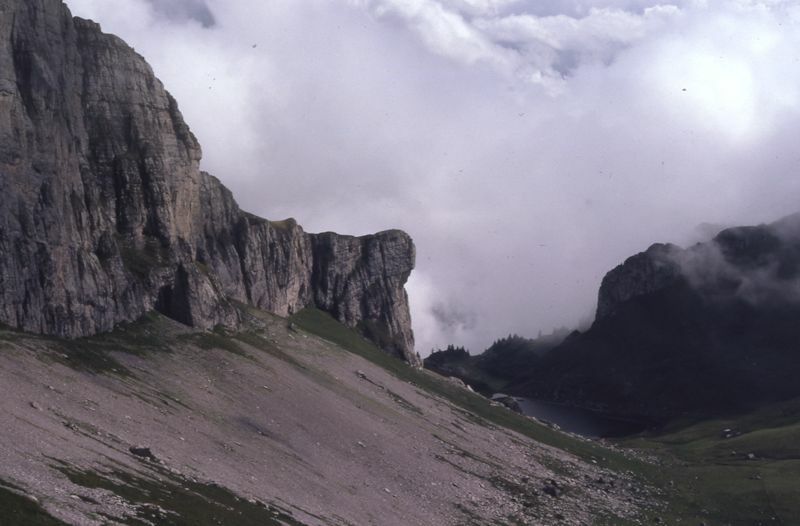 The Lac d'Aï at the foot of the mountain at 1892m. 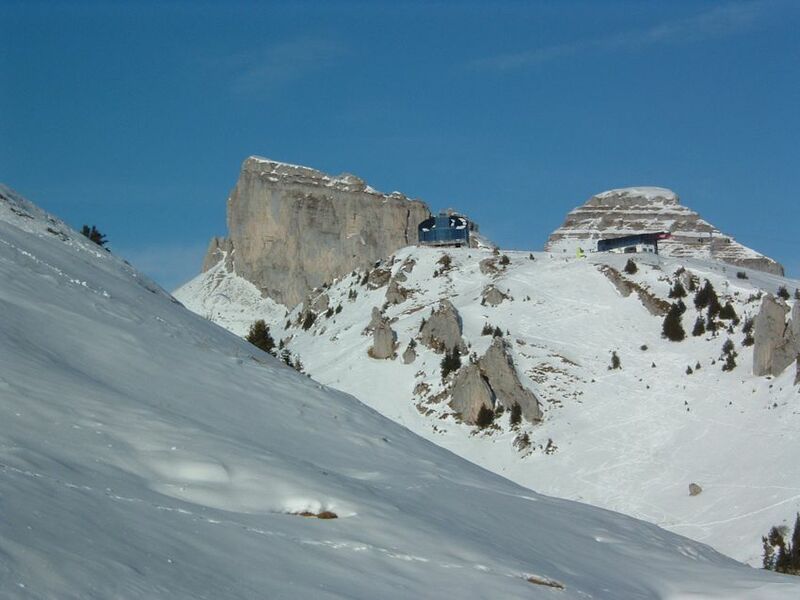 The Sphinx (centre) and Lac d'Aï from a campsite part-way up the Chaux du Mont. 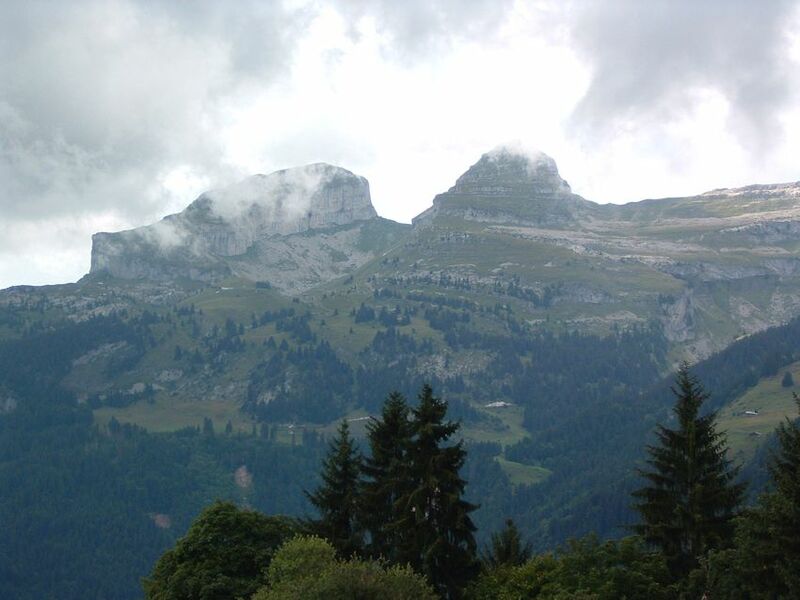 That night, a misguided military training mortar round came over the tent from the Place d'Armes in the valley of Hongrin behind us and lit up the sky briefly. 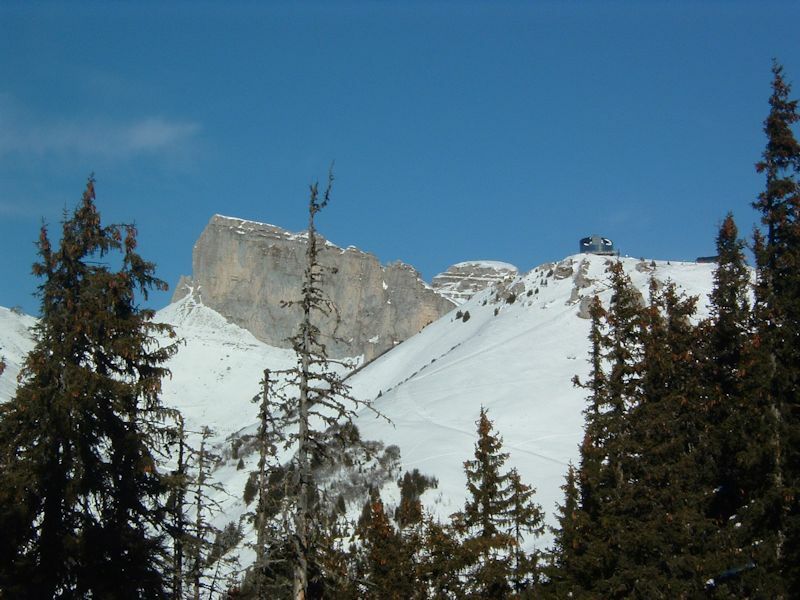 Probably the back side of Tour d'Aï (but perhaps the back side of Tour de Mayen instead), with the machined ski-touring path called the Sentier des Chamois or something clever like that. 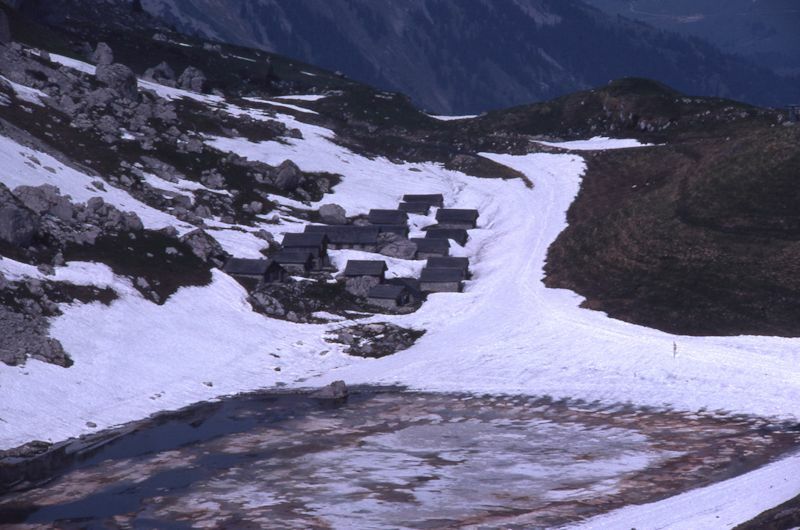 Before the level path was bulldozed, that traverse was frequently the scene of avalanched adventurers. 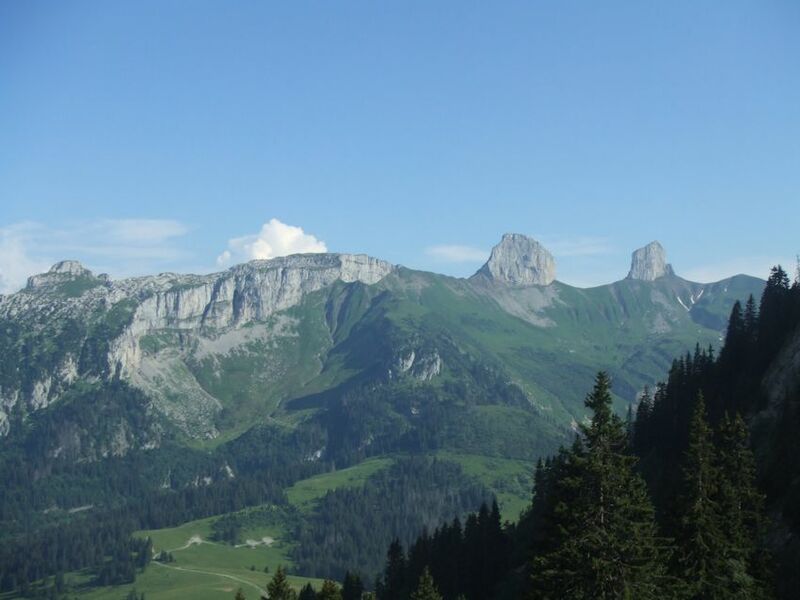 The Tour de Mayen and Tour d'Aï from the valley of the Hongrin on the far side of the mountains, to the north. July 2006. 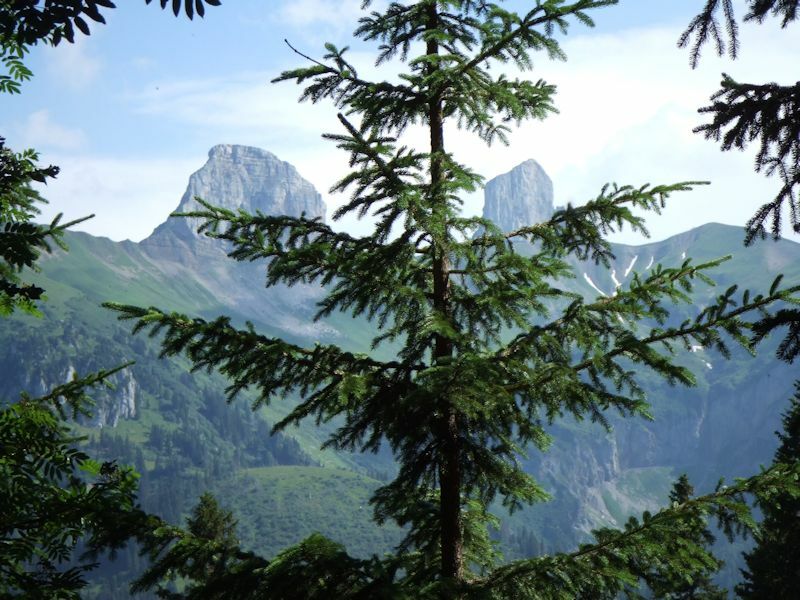 From part way up the path from Ayerne in the Hongrin valley military ground to the Pointe d'Aveneyre. 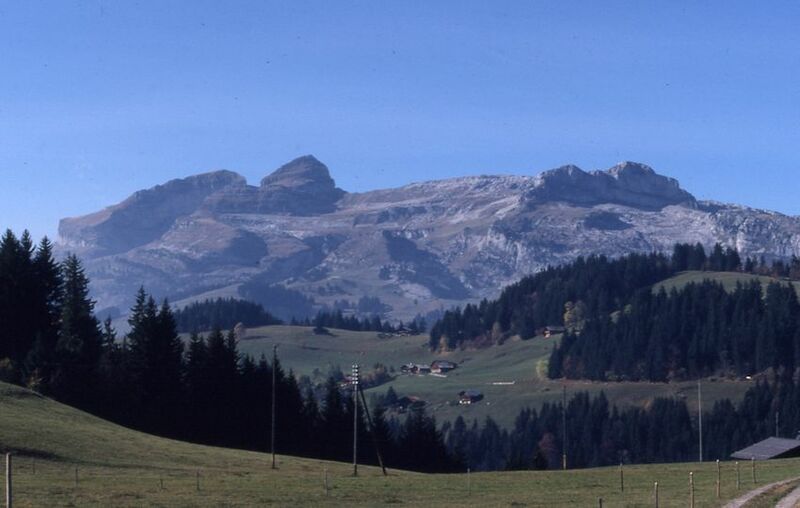 The Leysin range from the far side: Famelon on the left, Truex across the middle, Mayen, and Aï. July 2006. Feedback and suggestions are welcome if positive, resented if negative, . All rights reserved, all wrongs avenged. Posted 2 November 2006, revised 9 May 2008, 14 March 2014.